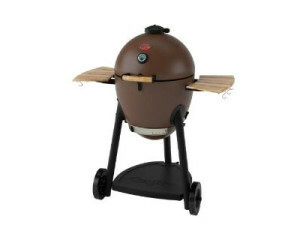 The Char-Griller Kamado Kooker Charcoal Barbecue Grill & Smoker is a lightweight, portable ceramic based grill that is also quick and easy to assemble. It should provide a range of grill and smoked options for entertaining, although there is no internal ceramic pot included with the grill. Upon initially installing the Char-Griller Kamado Kooker you will both admire and appreciate the lightweight frame and portability of the product. This portability offers the ultimate flexibility not only within your entertaining space, but also to take your grill to other gatherings and family events outside of your home. The Char-Griller Kamado Kooker heats very quickly and retains a consistent temperature for a long period of time. It is designed to trap heat inside of the highly insulated body of the product. The result is that a small fire will create a high level of heat intensity using a very slight amount of air and in turn, produce incredibly juicy meat. Whilst this grill uses charcoal as a fuel source, the cost of this grill is the best on the market by far, simply due to the kamado style construction. While the Kamado style construction is a positive aspect there are design elements within the unit that can detract from the pleasure of the cooked food that is produced. The frame holding the body of the unit is poorly designed and can be unstable, due to the fact that there are only three legs supporting the underside of the unit. The hinges, plastic legs, wheels and break are also a concern, as they appear to be of poor quality and not secured to the unit. It has a distinctive lack of quality fittings and materials used in its construction. Reports of short-term use of the unit have described the loss of handles, damage to the underside of the unit and to the cast iron grate situated within the unit. There also is a reported issue with the inside coating of the unit and the ash pans provided. Cheap Alternative To The Traditional Expensive Kamado Style Grill! Overall, the Char-Griller Kamado Kooker Barbecue Grill and Smoker is a cheaper alternative to the more expensive Kamado Style grills. If you are prepared to maintain the unit and supervise the unit while cooking, you should definitely try it. You will love the portability and the mouth-watering cooking it produces.